Visitors to Niagara Falls can now see the world-famous natural landmark from a very different perspective – gliding 200ft beside it, reports the Daily Mail. The waterfall’s first zip-line is now open to those who can brave the heights, carrying guests 2,200 feet through the Niagara Gorge at speeds of up to 40 miles an hour. 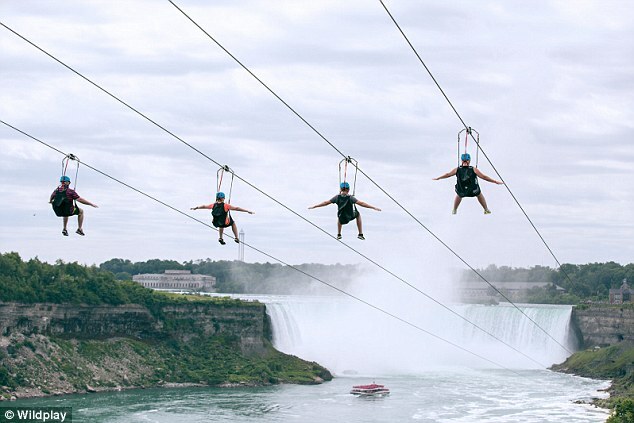 Four parallel zip-lines – which make up the ‘Mistrider’ – have been constructed on the Ontario side of the gushing falls, offering staggering views of both the American and Canadian Horseshoe. The operators are anticipating around 800 zip-line riders a day, four at at time, reports the Mail. It costs $50 and is only suitable for adults and children over the age of seven, and riders weighing between 50lbs and 300lbs.